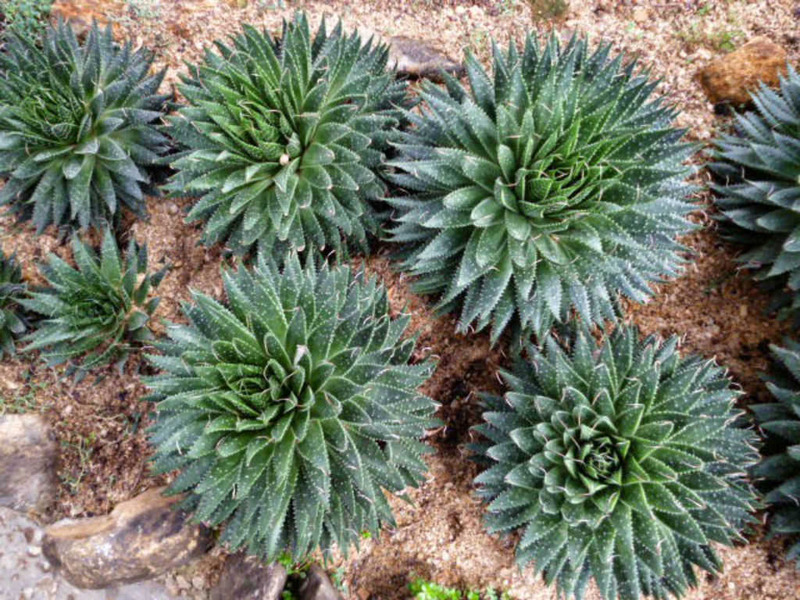 Aristaloe aristata, formerly know as Aloe aristata, is a small, hardy succulent plant popular as an indoor plant. It is commonly know as Lace Aloe, Guinea-fowl Aloe or Torch Plant. Lace Aloe is a stemless, up to 12 inches (30 cm) tall, clump-forming succulent with dense rosettes of stubby, lance-shaped, toothed, white-margined, dark green leaves up to 4 inches (10 cm) long, with small white spots and soft white spines, particularly beneath. In the fall, produces terminal panicles up to 20 inches (50 cm) tall, 2 to 6 branched, bearing cylindrical, orange-red flowers up to 1.6 inches (4 cm) long. Light: Bright light suits Lace Aloe. It will not thrive if permanently placed at a distance from a window. Soil: Dry and well drained gritty soils are suitable for these plants. Sandy free draining soil will keep the Lace Aloe healthy. Use succulent potting mix or add sand to improve the garden soil drainage. Temperature: Lace Aloes grow well in normal room temperatures and are tolerant of dry air. To encourage flowering, however, it is best to give the plants a short winter rest at a temperature of no more that 50°F (10°C). Watering: During the active growth period water plentifully as often as necessary to keep the potting mixture thoroughly moist. During the rest period water only enough to prevent the potting mixture from drying out. Do not permit water to collect in the tight rosette. Fertilizing: Feed Lace Aloe very little now and then during the active growth period. Use a soil based potting mixture. Most Lace Aloes should be moved into pots one size larger every spring. Keep these plants in shallow pots. When maximum convenient pot size has been reached, plants should be top dressed with fresh potting mixture once a year. To prevent rot, make sure that these plants which have tick basal leaves are never buried deeper than they were before. A sprinkling of coarse sand over the surface of the potting mixture helps to prevent rot points where fleshy leaves of these stemless plants touch the soil. In order to grow Lace Aloe in temperate climates it will need to be taken inside during the coldest weather and keep them in bright sunlight during the summer. This species is hardier than many other species within its genus, but will still appreciate the warmth. It requires very little maintenance, making it an ideal choice for novice gardeners. It flower freely in the summer and the soft-orange flowers are a wonderful addition to the arid garden. This genus is well known for its ease of cultivation, but it si sensitive to excessive irrigation. Provide regular watering in spring and summer to make the soil thoroughly moist then allow the soil to dry before watering again. In winter (during the dormant season) water sparingly or not at all, as it is prone to rotting. A thin layer of gravel on top of the soil will help to prevent this. Lace Aloe produces offsets that can be taken from the base of a plant early in summer. These small new rosettes are often attached to the parent by a short underground stolon and may already have little roots, which should be retained for propagation propose. Because very tiny offsets are hard to root, they should not be removed for planting until their leaves have begun to open into the characteristic rosette shape. Offsets will root in 2 to 3 weeks in the standard potting mixture if some coarse sand is sprinkled at the base of the rosette to prevent rotting. Until offsets are well established, they should be provided with bright light without direct sunlight and they should be watered only enough to moisten the potting mixture, allowing the top 2/3 of the potting mixture to dry out between waterings. Also, Lace Aloe can be propagated by seed sown in warm environment as soon as ripe. Most likely to be caused by incorrect watering. A properly watered Lace Aloe can resist most pests and diseases. Wilting is the result of inadequate water in summer. Yellowing leaves accompanied by rotting at the base is the result of overwatering plants kept in cool winter conditions. Mealy bugs and root mealy bugs ca be troublesome. The former hide deep in the crevices of rosette foliage and the latter generally bury themselves in the roots, just below the surface of the potting mixture. Remove visible bugs with a toothpick or a damp cloth or swab them off foliage with a small, stiff paintbrush dipped in methylated spirit or an insecticide solution. Then spray all top growth with an appropriate pesticide. Alternatively, place granules of a systemic pesticide in the potting mixture. During the next month examine plants weekly for traces of reinfestation. Scale insects can also infest this plant. They can be easily controlled by physical removal, wash off with high pressure jet of water or scrape off with cotton wool buds or by chemical control with appropriate pesticide.